It’s not just about the bars. Real techies measure cell phone signals in dBm, and ignore the cell phone bars. Why? Because as I said a few years ago, those bar measurements are pretty much meaningless. Before I really get into the answer, let’s talk about the obvious fact – the most important measurement of signal strength is whether you can make calls and get internet. If you are able to hear the person on the other end, if they can hear you, and if you can surf and stream as fast as you want, then ignore the bars! And don’t bother trying to figure out the “real” measurements. All that’s important on your device is that you’re happy, and if your phone works like it should, you’ll be happy. If you do need to dig into those signal measurements though, the best way to start is to know what your “real” signal strength is. 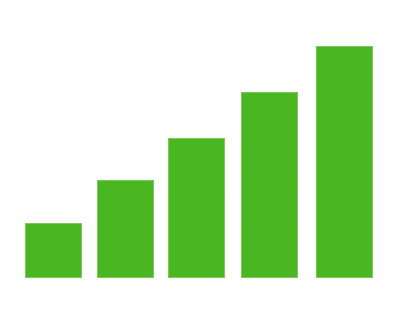 Signal strength is measured in dBm, which is a little hard to understand. It’s a logarithmic number expressing how much more or less than a milliwatt your signal is. If you don’t feel like the deep dive into technical territory, know that in almost every case dBm will be a negative number and therefore, the closer it is to zero, the stronger the signal. It’s generally agreed that anything over -70dBm is very good, while anything over -90 is passable. Lower power levels than that will probably mean the possibility of lost calls or slow streaming. When that happens, you’ll probably want to consider a cellular signal booster. The real issue right now is actually getting that dBm number. Until recently it was possible to get that actual number quite easily whether you have an iPhone or Android. Unfortunately the latest operating system took away the most common hack to get that number on iPhone. So, if you want to see your signal strength and all you have is an iOS device, you’ll want to find a friend with an Android and get him or her to download a free app (I like Signal Strength myself). If you don’t have a friend with an Android, get yourself a prepaid phone… you don’t even have to activate it in most cases to install and use a free app. Most free apps still won’t give you the whole picture because they’ll give you only one measurement that represents all the radios in your phone. You would need a professional quality signal meter in order to get a full and complete idea, but at least the free apps will give you some idea. Is it time to think unlimited? Can you connect a cell booster straight to your phone?